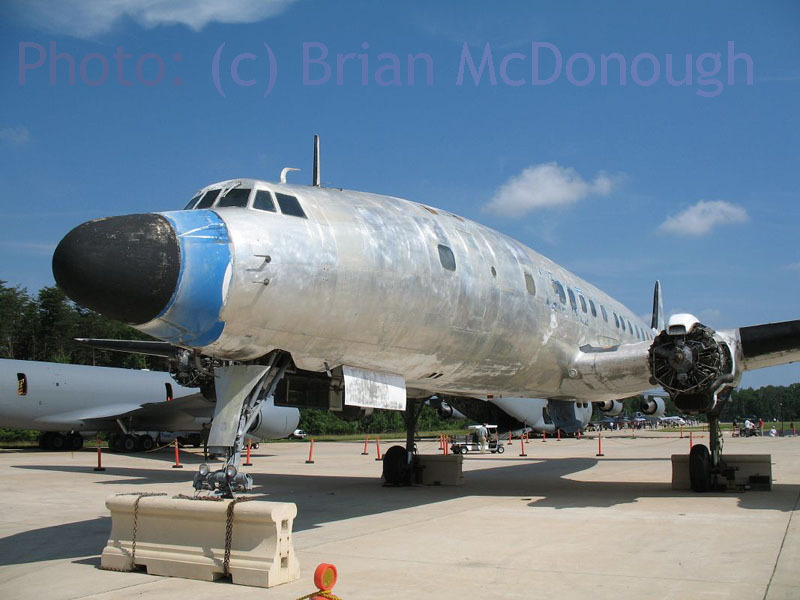 For a number of years, Brian and me exchanged photographs of airliners. While we sent prints of modern airliners across the Atlantic, the onset of digital photography and my increasing commitment to the website (and all that it entails) changed my priorities and the exchange was stopped. But Brian did not stop travelling and these days sents me the occasional propliner, which I gladly share on this page. 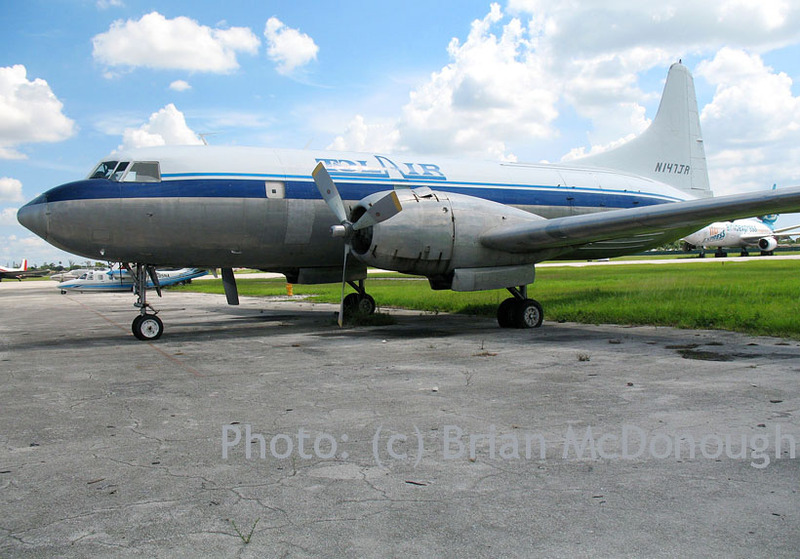 "I'm sending you some photos of Convairs from MIA & OPF which I shot recently." Air Tahoma N587X, msn 361. Shot at MIA on 13Jul07. 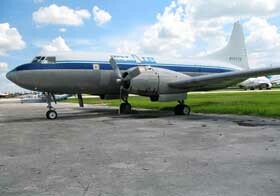 This Convair CV580 was registered to Air Tahoma on 10Jun05. 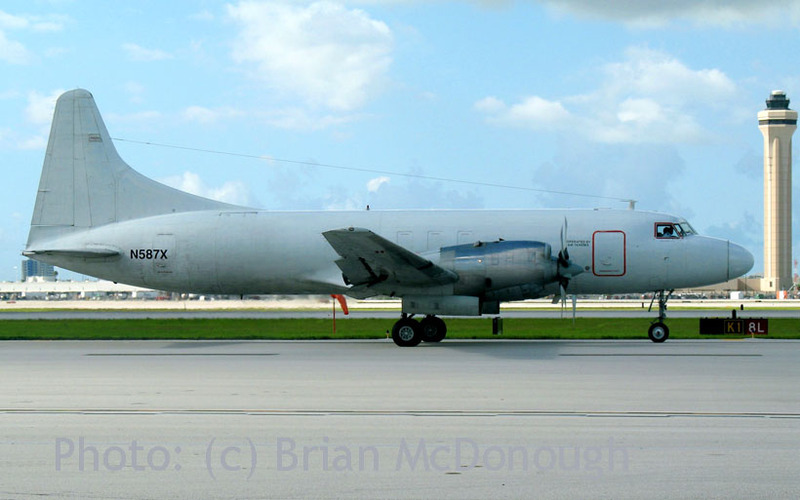 Tailnumber N587X was assigned on 01Nov04, in name of 'N580X' (also of Spanaway,WA) while operating for Air Tahoma. Delivered as a CV440 to SABENA it was registered OO-SCN and thus started its career in 1956. After Frontier bought it in 1967 (N73162) it was converted to CV580 two years later. 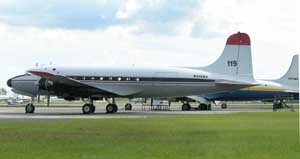 Since then it has also operated for Combs Airways and Metro Airlines / Metroflight. It returned to Belgium for European Air Transport (operating for DHL) in 1988, becoming OO-DHJ. DHL Airways registered it as N73162 on 22Jun89, reregistering to OO-DHJ again on 02Mar90. It turned rather exotic upon registering as HZ-SN14 for SNAS in Saudi Arabia in 1995. 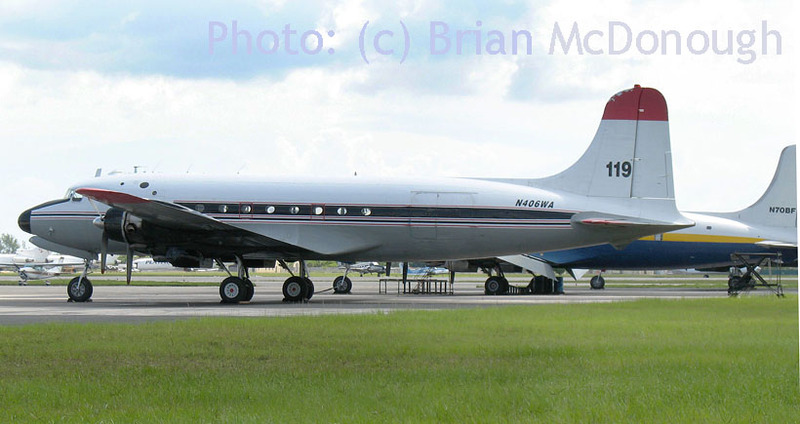 Convair CV580(F) N582P (c/n 475) at MIA on 13Jul07, awaiting its cargo. Air Tahoma N582P on its way to its destination (MIA 13Jul07). Coastal Air Transport N154JR - CV340 msn 47 - Shot at Opa Locka,FL on 15Jul07. 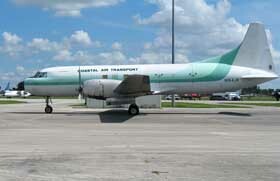 History of this 'skytruck' goes back to 1953 when it was delivered to Braniff Airways as N3416. 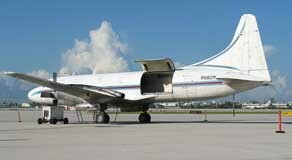 Owners and/or operators since then include Charlotte Aircraft Corp., Stereovision Int'l Inc, Trans Sierra Airlines, Sierra Pacific Airlines, Frank Davis Buick Inc, Music City Int'l Airways, Bahamasair, Gulf Air Transport, TAG Leasing, Purolator Courier, Emery Worldwide and Skyfreighters/Kitty Hawk. 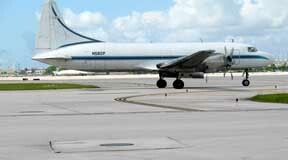 Taken at Opa Locka on 15Jul07. Life for this vintage airtransport started with the military: delivered to the USAF in 1954 as a Convair T-29C, tailnumber 52-1164. Its military career ended in 1975, at the MASDC in Arizona. 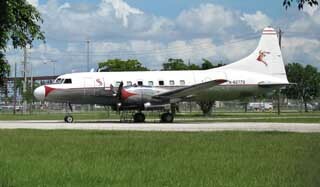 It was registered to Southwestern Alloys on 22Aug79 and its first civil registration, N154PA, was issued for Providence Air Charter on 12Aug80. Other operators were Corporate Air / Brennan & Hargreaves, Jarex Corp., Pandora Airlines/Rhoades, Air Cargo Express Int'l Inc. In June 1990 it received its present tailnumber N147JR after which it saw use by Fast Air Inc and Tol Air Services (registered on 24Jan94, to this day). 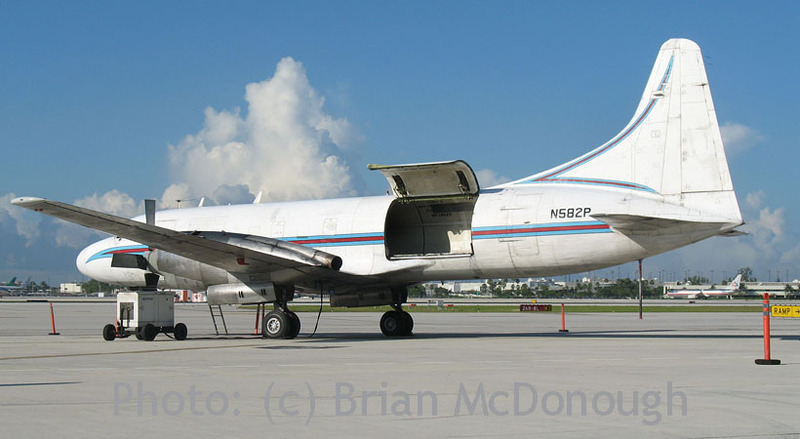 N8277Q was shot at Opa Locka on 15Jul07. This CV340 (c/n 282) is operated by Kestrel Inc. 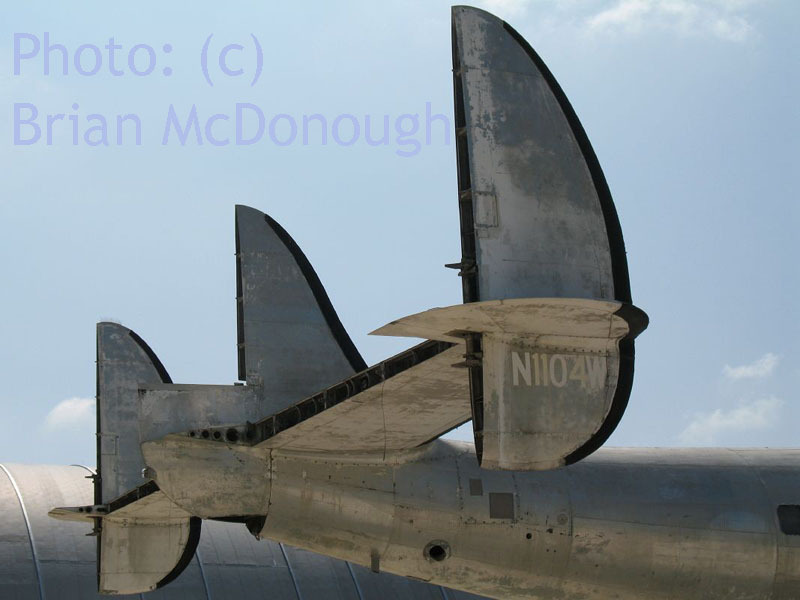 It was delivered to the US Navy, as a R4Y-1 (redesignated C-131 in 1962) with tailnumber 140999. It was stored at the MADC facility in Arizona from 1984 to 1992. As N14099 it was assigned to... the Museum of Naval Aviation in Pensacola,FL. But instead of being preserved it came back in circulation, in 1993 for Seco Aviation ! On 18Jun97 it was registered to Robinson Air Crane of Opa Locka,FL. It was registered as P4-SSG, supposedly for a company called Super Shrimp (of Aruba) but back at Opa Locka in 1998, where it was reported carrying the name 'El Generalito'... 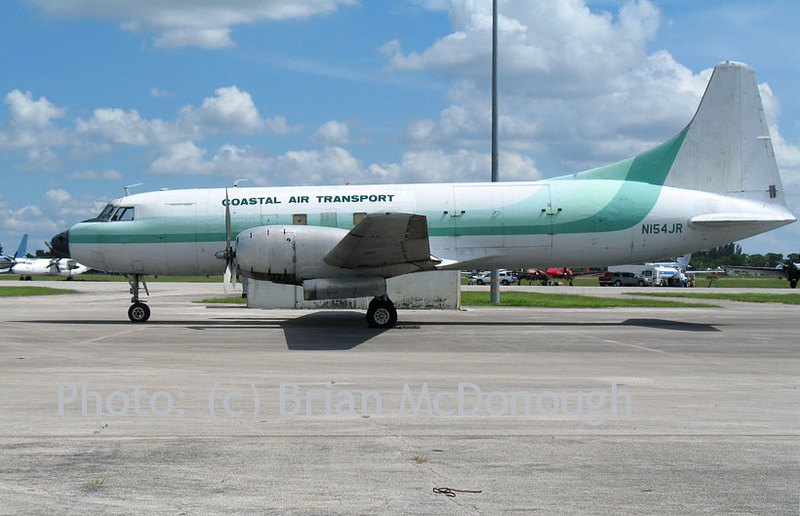 It seems to have spent most of its time here at Opa Locka, was registered to Jet Sales Int'l LLC (8277Q) in 1999, bought by World Jet, and was registered to Kestrel Inc (of Waukee, Iowa !) on 07Mar02. 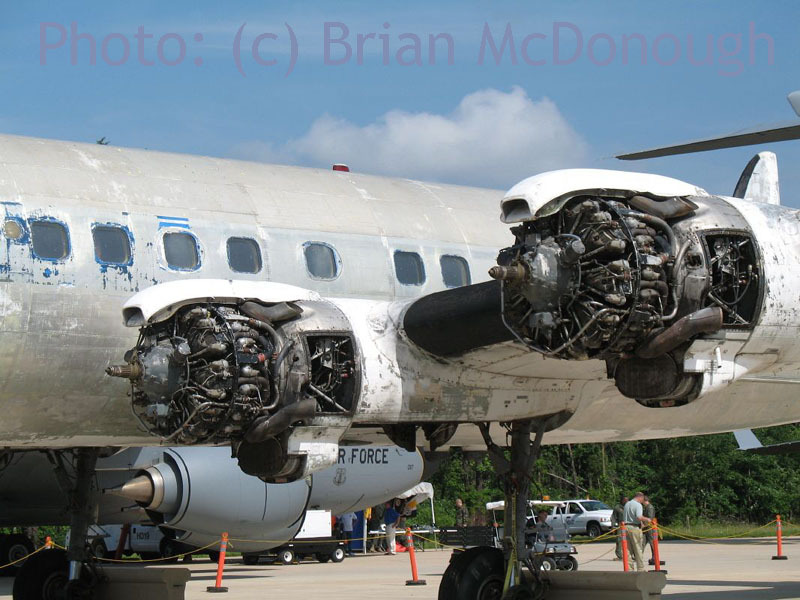 Florida Air Transport N406WA is a Douglas DC-4 (actuallu an ex military C-54G), msn 35944. Also seen at Opa Locka on 15Jul07. "I shot these at the Udvar Hazy Smithsonian NASM yesterday morning (16Jun07), they had a small static display open to the public. 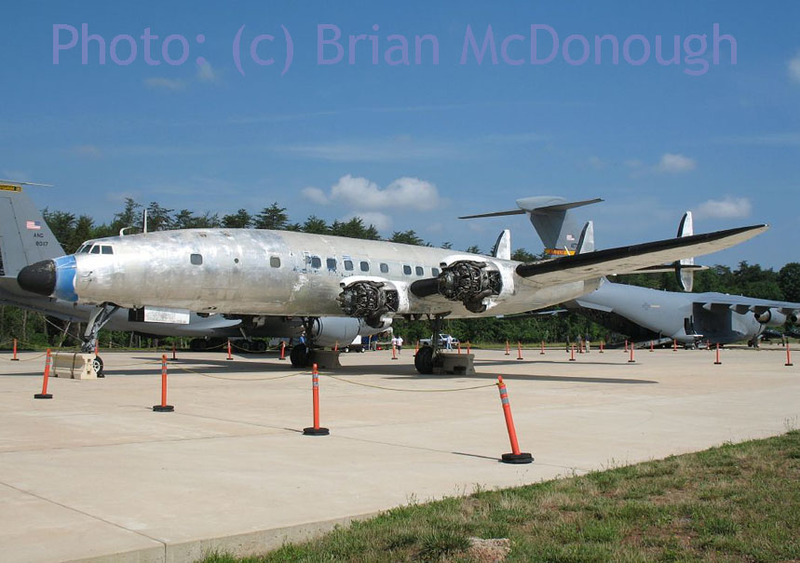 It is a C-121C (L.1049F-55-96, msn 4196); registration as N1104W, ex/ Classic Air. 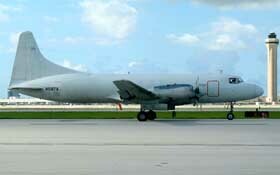 It was previously with the USAF, tailnumber 54-0177." This Connie was delivered to the USAF (MATS Atlantic Division) in March 1956, designated a C-121C and tailnumber 54-177 was assigned; it was named "City of Prestwick". It served the Mississippi Air National Guard from 30Oct1962, transferred to the West Virginia ANG on 19Apr67 and on to Pennsylvania ANG in 1972. 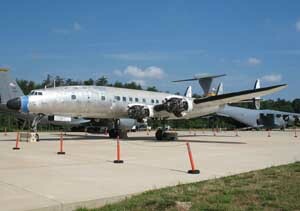 The end to its military career came when it was flown to Davis Monthan AFB,AZ for storage on 01Nov77. N1104W was flown to Dulles Int'l Airport,VA for the NASM in 1988. More on Connie Survivors website. 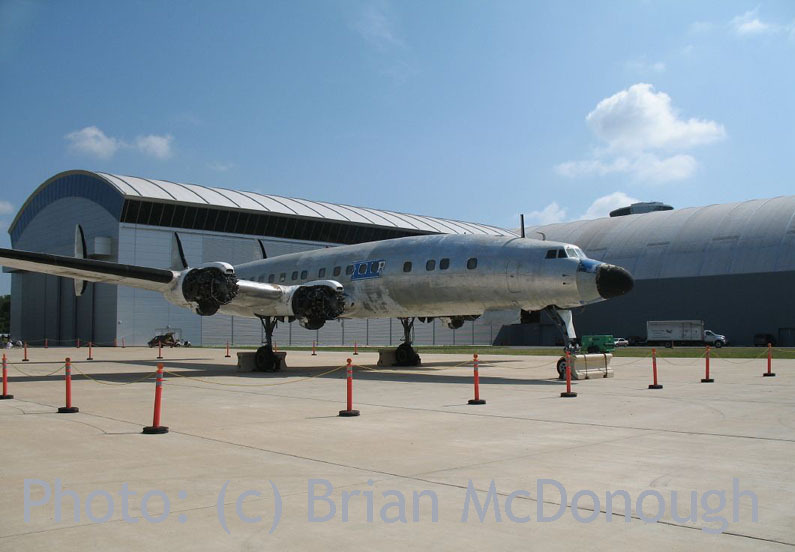 "I came across the photos of 54-0177 C-121C, at the NASM. The number struck a bell, so I checked thru my photo collection and came across this shot of her when she was with the West Virginia ANG in 1969. No idea of who the photographer was. 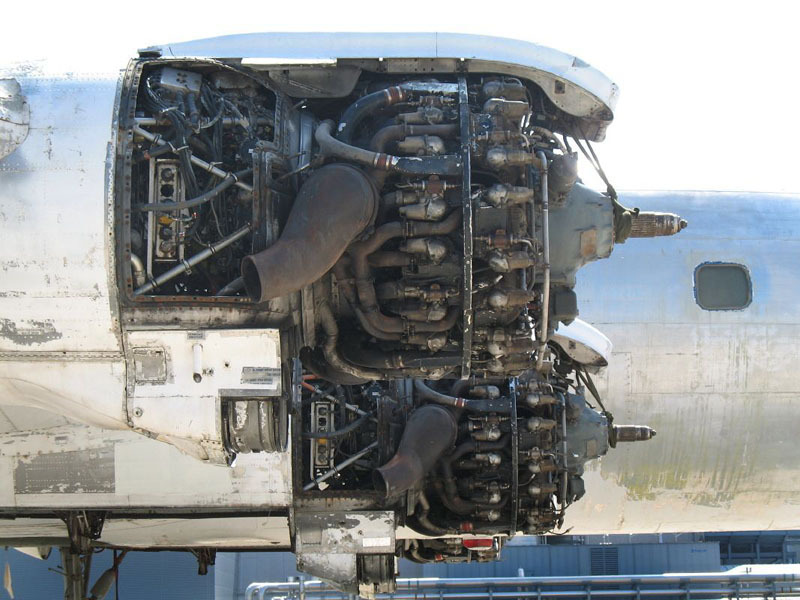 I bought this and several hundred other aircraft photos at a yard sale back around 1999." 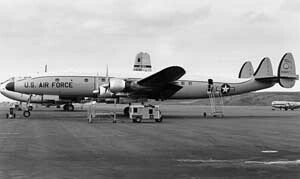 C-121C - 167 MAG - 167 MAS - WV ANG - 1969.